Twenty-five worshippers, mostly women and children, were killed and nearly 50 injured when a powerful blast ripped through a church adjacent to Egypt’s main Coptic Christian cathedral here during a Sunday mass, the deadliest attack against the minority community in recent times. 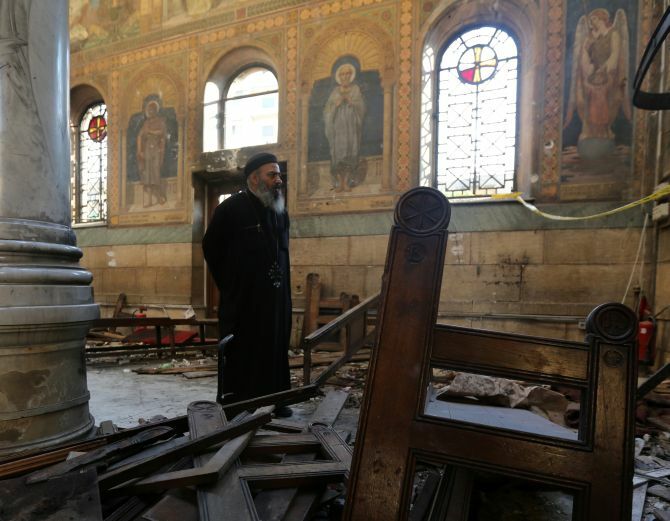 The explosion took place inside St Peter’s Church attached to St Mark’s Cathedral, the seat of the Coptic pope who heads Egypt’s Christian minority, in Abbassyia district of central Cairo around 10:00 am when the Sunday mass was on, Health Minister Ahmed Emad said. In the attack, 25 people, mostly women and children, were killed while 49 others injured, the minister said. The explosive device containing about 12 kg of TNT exploded on the women’s side of the cathedral, security officials said. 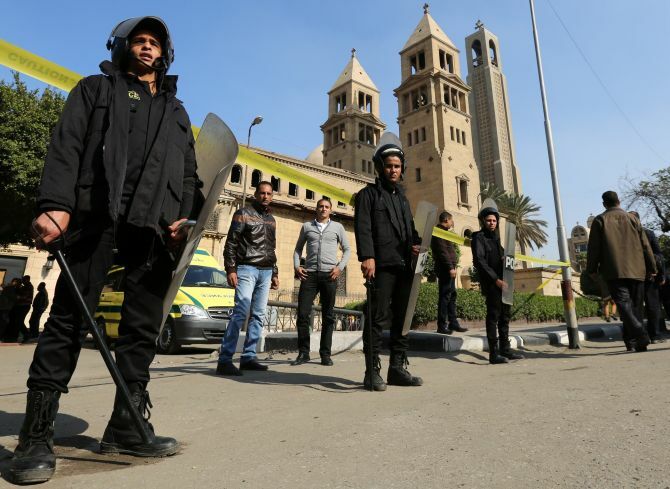 State-run MENA news agency reported that the bomb was lobbed inside the church, though some reports cited witnesses saying it was planted inside the church itself by a woman and remotely exploded during the prayer time. The reason of the large number of victims was because the blast took during Christian pray time and there were a large number of people inside the cathedral, a statement by the health ministry said. Services were being held in St Peter’s church on Sunday morning, while St Mark’s Cathedral was being renovated. 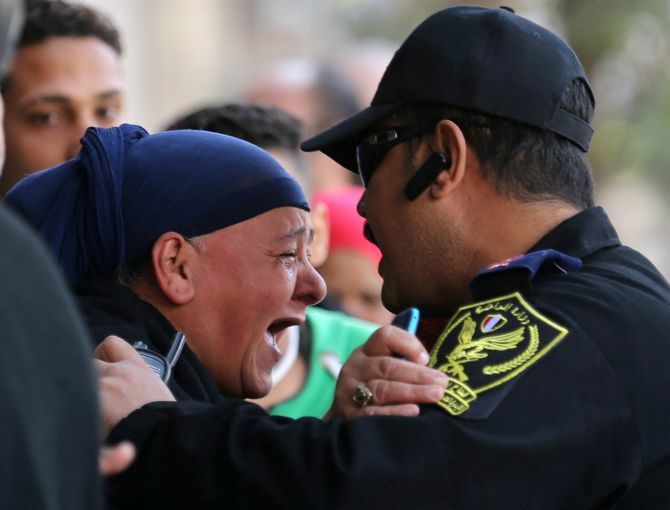 A three-day mourning was declared in memory of those killed in the blast, the Egyptian Presidency said in a statement. “The pain felt by Egyptians now will not go to waste, but will result in an uncompromising decisiveness to hunt down and bring to trial whoever helped, through inciting, facilitating, participating or executing, in this heinous crime,” a presidential statement quoted President Abdel-Fattah el-Sissi as saying. St Mark’s Cathedral is the seat of Egypt’s Orthodox Christian church and is home to the office of its spiritual leader, Pope Tawadros II. The head of Al-Azhar, Egypt’s top Sunni authority, condemned the blast as “a great crime” against all Egyptians. “The vile terrorist explosion” was “a great crime against all Egyptians”, Al-Azhar’s grand imam, Sheikh Ahmed al-Tayeb, said in a statement. The number of casualties may rise, the officials said, adding that the injured have been transferred to Dar El-Shefaa and AinShamsUniversityHospital. Security forces are screening the area and have blocked the main roads surrounding the cathedral. This is the third explosion in the country this week. On Friday, a blast killed six policemen and injured three others in Giza’s Haram district and another occurred in Kafr El-Sheikh international road, killing one civilian and injuring three policemen. There was no immediate claim of responsibility for Sunday’s attack, though jihadists in Sinai often target Christians as well as Muslims they accuse of working with the government. Copts, who make up about 10 per cent of Egypt’s population of 90 million, have faced persecution and discrimination that increased during the 30-year rule of Hosni Mubarak, who was toppled by a popular uprising in 2011. Islamist extremists have regularly incited violence against the minority community, especially since the country’s first Islamist President Mohamed Morsi was ousted by the military in 2013. Dozens have been killed in recent years in sectarian attacks and clashes across Egypt. In 2011, a suicide bomber killed 21 worshippers outside a church in the coastal city of Alexandria.